Ashiatsu Massage Training Class What Should I Expect ? Find Out. Ashiatsu Massage Training Class: What Should I Expect! Want to know what to expect when you attend an Ashiatsu Training Seminar? Then you have come to the right place! First, we will start by answering the most asked questions. Like, what should I do to prepare? Where can I find the best training? How to install Ashiatsu Bars? And what about the cost of the class? Will I receive certification? Is the course NCBTMB approved for CE? I’m a newly licensed massage therapist, is this class too advanced for me? How are the Barefoot Masters® workshops different from other providers? But let’s not get ahead of ourselves. We will discuss these questions in further detail. Here is what to expect when you sign up for an Ashiatsu Massage Training class. 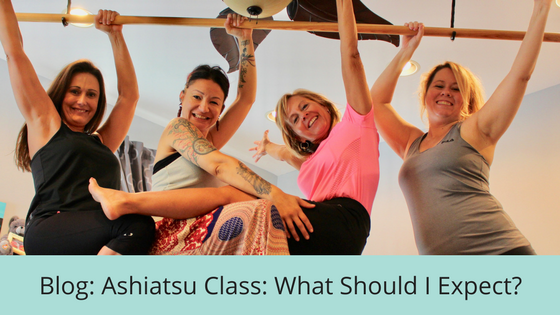 What can I expect in the 2-day Ashiatsu Bar Basic Course? Do you have guest clients for us to work on in class? Should I do special exercises to prepare for the program? Is there a weight or body type restriction? I’m a new LMT, is this too advanced for me to learn? Will you tell me how to build the Ashiatsu Bars? How does The Barefoot Masters® course differ vs. others? Will I receive certification in class or do I have to come back? 1. What can I expect in the 2-day Ashiatsu Bar Basic Course ? For the Ashiatsu Bar Basic course, we follow the usual protocol for registration. You can expect the usual fee, sign-in sheet, lecture, question, and answer then training. You then receive a certificate for continuing education hours and attendance. To be clear, the word Basic doesn’t mean it’s easy-peasy or watered down. On the contrary, no one breezes through day one. To begin with, you will receive the course materials in advance of class. In turn, this enhances the learning outcome, while it cuts down on the time-consuming lecture. Equally important, most of your energy is in use for hands-on technique or in this case, foot-on technique. Furthermore, we provide you with a complete digital manual. And, it comes with clear, detailed instructions to carry out each move. It covers the posterior and the anterior routine. Student receives the entire program. And not one broken into endless segments. Besides, that would cost twice as much. We value your time and budget. So, on Day 1 of the workshop, you are ready for class. Comparatively, expect it to be the toughest and longest day of course. In our classes, massage therapists work in threes. Most CE classes put students in pairs. When students learn in threes, it provides time to process the information. Also, it allows therapists to help and support each other. To cover the whole routine in one day is a lot for both students and instructor. Lighthearted banter is welcome and makes the day fun. Day-2, practices what you learned from the day before. Class ends with a practical on the instructor. It is our mission to exceed your expectations. 2. Is Ashiatsu Barefoot Massage For You? Is it your desire to give client’s an excellent deep-tissue massage? Deep Tissue Massage is wearing out your hands? Do you need to prevent over-use injuries from massage in the future? Is it possible for you to do deep-tissue massage all day? Does your menu lack new or exciting services? If you said, “Yes,” to any of the above, then Ashiatsu barefoot massage is for you. 3. Are guest clients provided for us to work on in class? Of course, we have guest clients. They are your fellow massage therapists, who are the ones who need a good massage. They also will give more informed feedback than from a layperson. Receiving massage is as educational as practicing it. Even having an outside guest can train wreck a class, if one of them is late or a no-show. Plus, we would need to add another day to the workshop which we can supply by request. It’s nice but not an efficient use of your time and money. A Barefoot Masters® instructor will watch your routine with a discerning eye. Our instructors want to see you succeed, not fail. Because, we remember what it was like to be a student and are always looking for ways to create a positive experience. We love Ashiatsu, and we want everyone to join in the fun. 4. Should I do special exercises to prepare for the program? In the first place, exercises are not needed. Nor do you need to be in any particular shape to take the Basic Ashiatsu workshop. This modality may not replace the gym, but it will get you in better shape than regular massage. So is there anything I need to do before I come to class. Okay, we know it’s a terrible thing to ask, but a pedicure is a requirement to take Ashiatsu training, haha! 5. Is there a weight restriction or body type? Or gender? As long as the massage table can hold you and the client, you can perform Ashiatsu. And for those who have a fear of heights, we also offer Ashiatsu Floor. And I’m excited to announce we have our new Floor Bars as well. Both men and women have successfully graduated from our courses. Another provider told one of our students that she was not the right body type for their program. Hmmm… What that’s supposed to mean? After reading about Barefoot Masters,® she mustered up the courage to call me. And asked about our program. Happily, I explained that our philosophy was inclusive, not exclusive. She took a leap of faith and took the course. Not only did she graduate, but she also went on to become an instructor of Ashiatsu. So, Jerry Dunn has put it this way, “Don’t limit your challenges, Challenge your limits!”. 6. I’m a new massage therapist, is Ashiatsu Massage too advanced for me to learn? Again this is a question that gets asked a lot. Even though you do not have a lot of experience, it doesn’t matter. Ashiatsu class is a challenge for everyone. Training your feet to do what your hands do is like trying to write with your non-dominant hand, but a lot more fun. The first day of Ashiatsu training class is a brainbuster. The second day is much easier. New therapists are starting off on the right foot(pun intended). It is smart to take Ashiatsu training to avoid incurring overuse injuries in the future. 7. Will You Tell Me How To Build Ashiatsu Bars? Although there is still no standard way to put up Ashiatsu bars, we cover this in class. Surprisingly, you will receive the schematics for overhead Ashiatsu bars before class. In case you want to put them up before class. Also, we have DIY Portable Ashiatsu Bar Instructions available. But, there is nothing like experiencing the use of the bars to help you understand how they work. There are five different ways to mount stationary Ashiatsu Bars, which we hope cover most situations. Also, we do sell the Portable Ashiatsu Floor Bars. 8. How does The Barefoot Masters® course differ vs. others? Honestly, answering questions about other programs are not our forte. Moreover, it requires us to keep up with what others are doing. But to be clear, we will not charge an extra fee for you to receive your certification. 9. Will I Receive Ashiatsu Certification? And What Does that Mean? Absolutely, we don’t make you jump through hoops to get certified. You will perform a practical in class on your instructor. After all some of our students travel great distances to come to our classes. We don’t expect students to make several trips to get certified. Nor do we expect you to pay an additional fee for the certification. You receive Ashiatsu certification in class. Certification means you are certified to offer Ashiatsu as a service. Some think it certifies them to teach. Of course, teaching Ashiatsu is not the same as receiving certification to perform it. Barefoot Masters® does have an instructors training program. Interested in becoming a Barefoot Masters® Ashiatsu Instructor Training. 10. Where can I find the best training? Lastly, we have been teaching Ashiatsu massage classes for 17 years. Barefoot Masters® developed the first complete manual of the posterior and anterior routine. Also, our manuals come complete with detailed instructions and pictures of each move. Currently, we are the largest barefoot provider in the USA. We too, have presented at AMTA and FSMTA National and State Conventions. Massage Magazine and Massage Today have published our articles a few of their issues. We are also an NCBTMB Provider #403532-0 of CE’s. All of our hand-saving courses are available in Live, Home Study and Online. Rather become an instructor? Then practice Ashiatsu until you know it well. Instructors should train under someone who has teaching experience. Also, they should use top-notch educational materials with a tried and true curriculum. So, for the best Ashiatsu training, you have come to the right place. Thank you for taking the time to read our blog. We hope it covered most of your questions about Ashiatsu training. But if you don’t see your concern included, please feel free to ask. Michelle D. Mace has been a massage therapist for 20 years. She is the CEO of Barefoot Masters®. A developer that dedicates continuing education to save the hands of massage therapists.